This is where it all started with a desire to share the amazing potential in found objects with children and educators around the world. To create a place where like minded educators, designers, facilitators and creatives everywhere in the world can meet and dialogue. If you are using found objects in your work or would love to begin, you can find inspiration and a voice here. Explore and don't forget to contribute to the conversation, as this will make it more possible for learning to happen everywhere. We love to travel and play with things. Find out more about our NEW traveling Workshops for 2018/2019 school year . NEW! 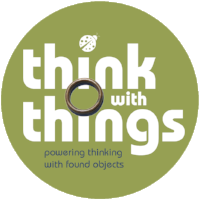 We launched our online community Think with Things Island. An amazing place to be inspired and share your stories with other like-minded professionals. We would love to come and tell you our story and hearing yours. Our Think with Things founder is an impassioned speaker.